Beautiful views of natural prairies from the sunroom and patio. 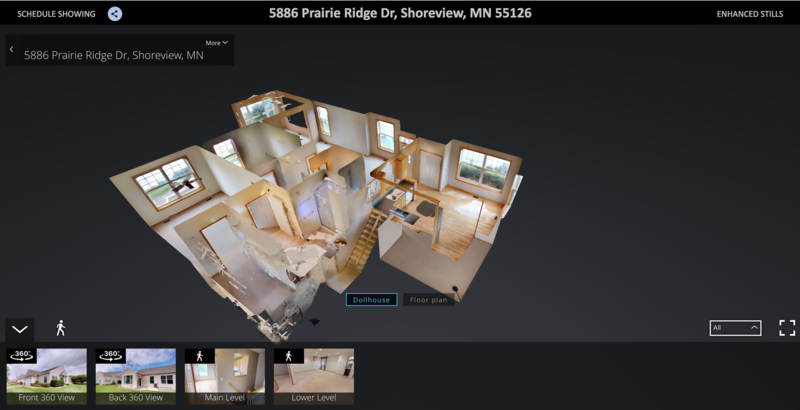 Watch 3D interactive tour link, take a walk through the home right from your computer. Not just a slideshow. Additional supplements are available upon request. Professionally painted throughout the home. Cleaned carpets. Some updated light fixtures. Refinished kitchen wood floors. Beautiful views from the sunroom and private setting on your patio. Truly one level living with laundry on the main level. The master ensuite has soaking tub, walk in closet and private views of the prairie. The lower level has additional bedroom, bathroom, family room, a large room for a movie theater or work out space and plenty of storage. Step out your door and take advantage of the beautiful nature that surrounds the back of your home. There are walking paths that are along Rice Creek Park that led to an off leash dog park.